Mariah Carey's precious twin babies undoubtedly are growing up fast. 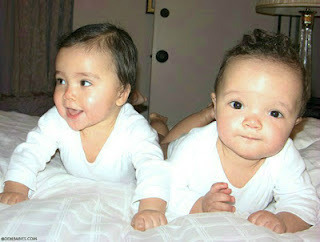 The proud mom of nine-month old son Moroccan and daughter Monroe recently tweeted a new picture of her bundles of joy. In a move to remind Twitterverse of her beautiful offspring, the picture was posted on the same day that Beyoncé unveiled the first image of her month-old daughter Blue Ivy. Coincidence?